In some cases typos can causes feuds. In TALES OF BAD MEN, BAD WOMEN, AND BAD PLACES, by C. F. Eckhardt, he demonstrates why spelling, grammar, and punctuation matter. In 1886 in El Paso, Texas on what used to be known as South Utah Street (now South Mesa Street) was the center of the city’s red-light district. The queen of the district was Alice Abbott, known as Fat Alice. She was six feet tall and weighed over 300 pounds. Editor Frank Brady of the El Paso Herald suggested that if P.T. Barnum was looking for a mate for his elephant Jumbo, he need look no further than a certain address on South Utah Street. Alice was not one to forget—or forgive—such a slight. Across the street from Fat Alice’s place there was a house run by a woman named Etta Clark, who was called Little Etta. She stood about five feet tall and probably weighed less than a hundred pounds. The fight began when a woman called Bessie Colvin decided to leave employment at Fat Alice’s and work for Little Etta. At about five-foot-two Bessie was petite—except for her figure that had and especially well-endowed bosom. Fat Alice objected to Bessie leaving because Bessie was a drawing card for the house. In addition, Alice had invested money in fancy clothes that would only fit Bessie. Etta agreed to give Bessie a chance. When Bessie went back to get her clothes, Fat Alice tried to stop her. Bessie got away and ran across the street and locked herself in Etta’s house. When Alice pounded on the door, Etta made a mistake. She opened the door and said, “She doesn’t want to see you.” Alice charged through the door and grabbed Bessie by the wrist. Etta whacked Alice with the lighter she used to light the gas lights and got knocked across a hallway by Alice’s ham-sized fist. Outside, Bessie broke away and ran back to Etta’s. By this time, Etta had pulled herself together and stood in the door with a nickel-plated Iver Johnson Bulldog .44 in her hand. When Alice turned around to pursue Bessie once more, Etta told her to stop. Alice didn’t. Etta fired. The slug hit Alice in the pelvic area, not a life-threatening injury under normal circumstances. The doctor who treated her gave her a 50-50 chance due to the unsanitary conditions at Alice’s establishment. Etta surrendered herself to El Paso police immediately and was charged with attempted murder and posted a $2,000 cash bond. It took a jury only fifteen minutes to acquit her. The news of the shooting went immediately to the El Paso Herald. The location of the bullet hole was a problem to describe. Newspapermen decided to describe the wound as being in the “pubic arch”. The typesetter made a slight error and described the injury as to the “public arch”. Alice decided the description was deliberate and announced she was going to blow “a hole a horse could walk through” in Frank Brady. Shortly thereafter, Brady took an editing job in Albuquerque, New Mexico. Probably a wise move on his part. 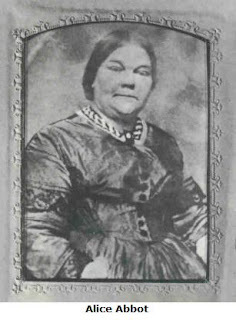 Alice Abbott died April 7, 1896 in El Paso. No one knows what happened to Bessie Colvin. 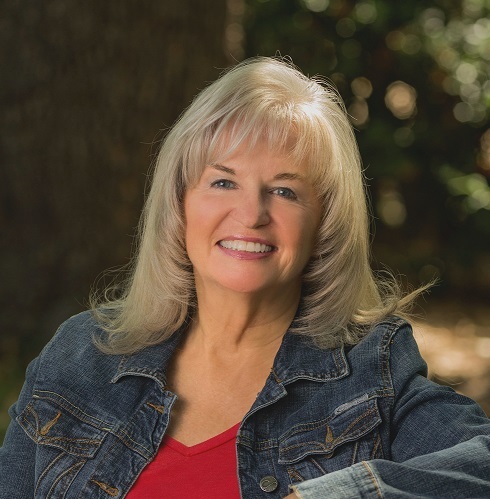 Caroline Clemmons is an Amazon bestselling and award winning author of historical and contemporary western romances. Her latest is a Christmas story, MISTLETOE MISTAKE, now available for pre-order and releasing Friday, September 29, from Amazon. 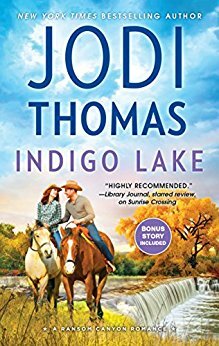 I have enjoyed every book I’ve read by Jodi Thomas. This is no exception. Seeing well-loved characters pop up with new ones makes this a fascinating read. Having grown up in West Texas, I believe I know where Ransom Canyon is. 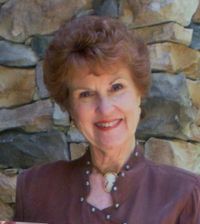 Whether I’m right or not, the series is a must-read for anyone who loves western romance and the Southwestern culture. 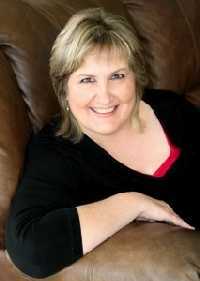 Jodi Thomas brings the land in as a character as well as the people in her stories. Blade Hamilton has inherited a ranch and comes to investigate the likelihood of being able to sell the place. His land is separated from his nearest neighbor by a dark blue lake, Indigo Lake. When he meets his neighbor, Dakota Davis, he learns the Hamilton and Davis families are enemies. 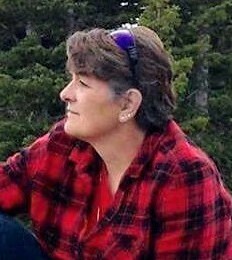 Dakota’s grandmother, who I instantly loved, makes certain Blade knows he is treading on dangerous ground by setting foot on Davis land. Dakota’s sister, Maria, was blinded in an accident but still cooks as if she were sighted. Maria sells her jams and jellies in town. Another thread of the story deals with Lauren Brigman and Lucas Reyes and Reid Collins. Reid is the one who claimed to have saved himself and friends when they were fifteen, although Lucas was really the hero. Now, Reid is in trouble. I really can't reveal more without giving spoilers. I will say I was happy to see some loose ends pleasantly resolved. 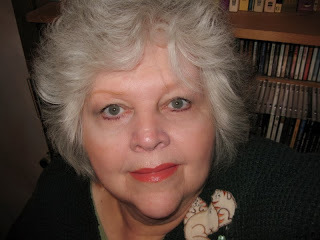 Once again, Ms Thomas weaves together a compelling story unable to resist. Don’t miss this book. At the back is a reprint of the novella, WINTER CAMP, as a bonus. I must give this book 5 stars! At a library sale years ago, I picked up a rather thin yellow book called The Danish Texans. It caught my attention because my husband is of Scandinavian descent, and his last name (my married name) ends with “sen” – common in Denmark. Sadly, that little book has perched on my bookshelves, being ignored among all the bigger, more imposing tomes about Texas – until today, when I finally opened it while hunting up a topic for this blog. I found myself instantly immersed in John L. Davis’s tale of people who left Denmark to forge new lives in America, particularly Texas. The bulk of Danish emigration to America occurred from 1820 to 1920. In the early decades a majority of the immigrants were landless farmers who could not earn enough as farmhands to marry and raise a family. A few came from cities like Copenhagen, bringing diverse skills. According to Davis, when asked why they emigrated, some Danes said, “I did not want to be a common laborer in my own country” or “I did not care to live such a life of drudgery and poverty as my parents lived; I can’t do worse in America, and I may do better.” Still others left home looking for adventure. One adventurer was John Edward Henrichson, the son of a Copenhagen cabinetmaker, who put to sea as a cabin boy at the age of twelve in 1819. By then, he was as big as most sailors. When grown, he stood almost seven feet tall and weighed nearly 300 pounds, all muscle and bone. I search for a picture of him on the web, but no luck. Dangit! Young John helped keep records for the trading ship and employed skills learned from his father to build and repair cabinets onboard. He made several voyages including into the Gulf of Mexico, travelling on trading missions into Mexico and on flatboats up the Rio Grande. The ship also stopped in ports along the Texas coast. Leaving the sea, Henrichson settled in New Orleans, married a wealthy widow and used her plantation as a base for trading activities. 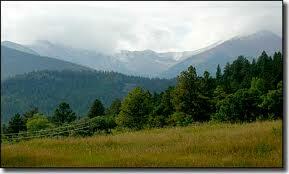 However, he was attracted to the Nueces-Powderhorn area of Texas which he had seen on his travels. In the late 1830s, he left his wife, taking their three children, ages between five and ten years, and headed for Texas. He became a rancher and trader in the future Corpus Christi area, bought and sold land, and ran a supply store. Henrichson became known as “El Grandor” because of his size and because he was a friend to all. He could not ride the small mustang horses for very long due to his weight. When he did, his feet almost touched the ground, so he mainly walked wherever he went. He and his son served in the Mexican War as a blacksmith and wagon driver respectively, but only until U.S. troops crossed the Rio Grande, at which point both men returned to their ranch. 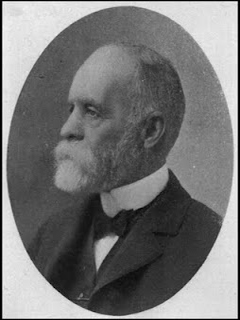 The elder Henrichson became fairly wealthy. Not trusting banks, he buried gold coins on his land, failing to reveal where he'd hidden the gold to his son before he died in 1877. But don’t worry, the family did just fine thanks to the ranch John founded. Most who settled there were farmers, but a few were craftsmen. Christian Moelbeck was a saddlemaker, Paul Paulsen a cabinetmaker, Niels Thompson a carpenter and bricklayer, Peter Jensen a blacksmith. 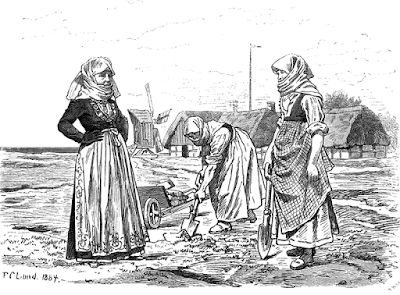 Single men among the settlers most often married local girls. Some husbands came alone from Denmark, sending for their families later after getting established. There were enough Danes in Little Denmark to preserve their culture for a while, but most quickly adapted to American ways. Many names changed: Thomassen became Thompson, Rasmussen changed to Robertson, Jens became Yens because Americans didn’t pronounce the Danish names correctly. Some families taught their offspring Danish but English soon became the predominant language. Their religion also changed as members left the Lutheran church in favor of local denominations. 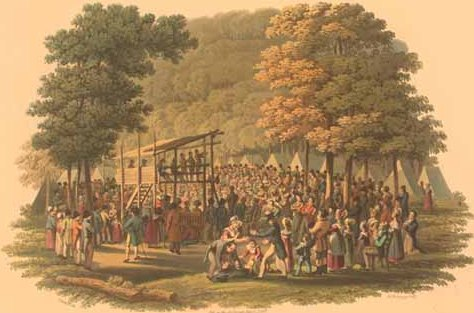 Brush arbor camp meetings were different from religious gatherings in the old country. When a minister conducted such a meeting, families came prepared to stay a week. Some brought milk cows and/or chicken coops in their wagons; blankets and even tents might be included. The Danes did maintain some traditions such as beer and polkas at community gatherings, and foods such as kartofler (boiled potatoes) and rodgrod (thickened fruit juice pudding.) They also did not give up the custom of pastry and coffee every day at 10 a.m. and 3 p.m. Otherwise, they lived like most settlers. Women made clothes for their family, prepared food and cared for the children. Men farmed or worked at a craft, or both, selling any surplus in town. Most families had large vegetable gardens and fruit trees. One man from Copenhagen, Peter Christian Jensen, soon had a 375-acre farm, which he never could have acquired in Denmark. When a dispute arose over who could attend a private school, Peter donated part of his land for a school he named the “Equal Rights School.” Anyone could attend. 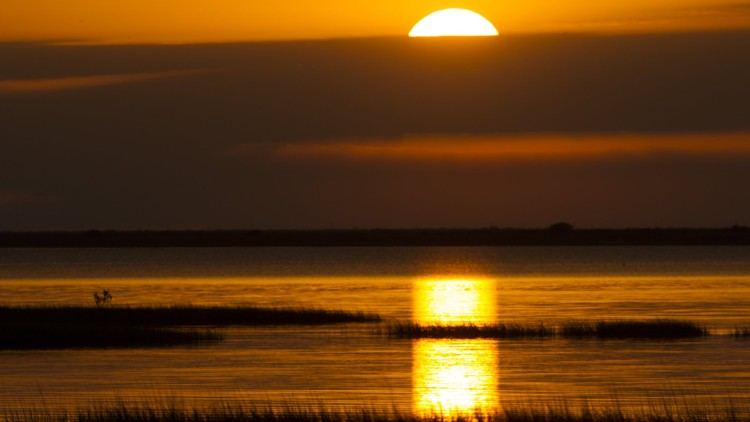 There is so much more I would like to share about the Danes who came to Texas, but this is getting rather long, so I will end with a charming little story recounted by Mr. Davis. It made me chuckle. 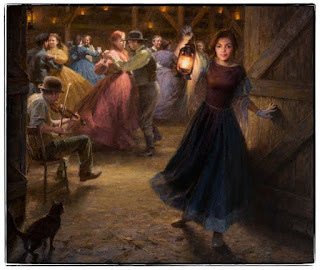 I am certain many of you are familiar with Square dances, the Virginia Reel, and even today’s Line Dance and two step and so I know most of you are familiar with the dance caller who calls out the next move the dancers are to take. I recall doing this type of dance as part of the history class back in grade school. The dances were often referred to by the cowboys in their own special lingo as “hoe-dig”, “shin-dig”, or “stomp”, and if anything was important to a cowboy, these dances were, indeed, of extreme importance. There were no invitations sent out or big announcements made, just word of mouth to let everyone know a dance is coming up. Everyone considered themselves invited to these affairs and they intended to be there even if they had to ride 60 miles to get there. Apparently, when a cowboy decides he wants to do something, no obstacle is too big to stop them. Whoever gave one of these affairs, had to prepare in advance because there was a whole lot of work to be done. There were mountains of beef to barbecue and the women pitched in making dozens and dozens of pies, cakes, bread, and dough-nuts which they fried by the bucketfuls. The cowboys dug deep to find their Sunday-go-to-meetin’ outfits to “slick-up” for the dance. They laundered their clothes and “greased” their boots, cut each other’s hair and shaved. None thought about the dusty trail to get there that was certain to discount their preening efforts. The women who lived a bit closer would bring their “party clothes” in a “go-Easter” to change into before the party started. 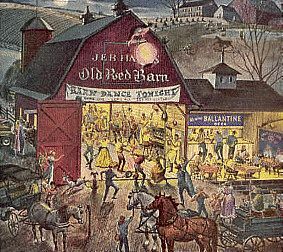 The first guests to arrive, whether it was by horse, buggy, or wagon, helped with the final preparations. By the time dinner was announced up to a hundred guests might be present. Most of the food was consumed at that meal, but there always seemed to be sandwiches, pies, dough-nuts and cake left throughout the festivities. 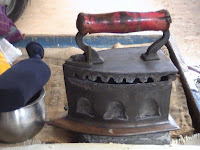 Coffee was constantly available in a pot on the stove. Once supper was finished, the furniture was removed and planks and boxes were lined along one wall for the convenience of the women folk. Since there weren’t as many women as men, there was no such thing as a wall flower. Women barely had a chance to get a rest between dances. Women were so scarce, some of the men tied a bandanna around their upper arms to indicate that they would take the place of a woman for dancing. The old fiddler would fire up his fiddle to announce that the dancing was about to begin. 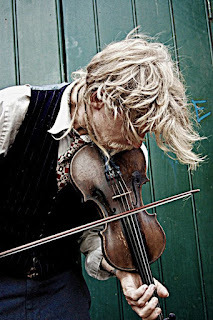 The fiddler was usually a unique individual who was considered lazy, shiftless, and a person who rarely refused a drink of spirits. In the special language of cowboys these fiddlers were often referred to by their shortcomings with statements such as “He had more friends than fiddlers in Hell”, or perhaps they would say, “Lazy ‘nough to be a good fiddler” or “Drunk as a fiddler’s clerk.” No matter how little the cowboys thought of fiddlers on a daily basis, at a cowboy dance, the fiddler was king. Another important person at the dance was the “caller”. The cowboys referred to this person as “leather-lunged” and “loud-mouthed.” He was usually a carefree fellow and unassuming. He often invented special new calls and they could be picturesque calls which he called out in a monotone voice in time to the music. Three hands ‘round an’ go it again. Seat yo’ partner in the old arm chair. The dance usually lasted until dawn. The caller would leave hoarse and the fiddler worn out. Exhausted and sleepy, the guests would ride back to their ranches as the music and calls ran over and over in their heads and produced smiles on their faces until the next dance. 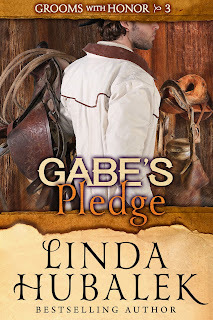 For researching Gabe's Pledge, book three in the Grooms with Honor series, I googled 1800s saddles, saddlemakers, tools, etc., since the main character is a saddle maker. I could probably spend as much time reading facts and looking at images as I do writing the book. 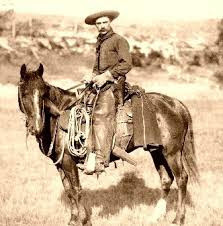 "When men lived in their saddles, the saddles had to be sturdy, comfortable, durable, functional and versatile. The long cattle drives of the 1860's through the 80's pushed saddle development to its limits. The stock saddle had to be adapted to survive over six months of constant use under the harshest conditions and weather extremes without major failure. The saddle had to be built so minor repairs and replacement of worn parts could be done on the trail. You had to be able to fix it with a pocket knife and a rock. These requirements are what developed the stock saddle of the Old West." Here's some interesting facts (at least to me). *1885 Steel horns appear. Wood horns would often break from the strain of tying off cattle. Steel replacements started to be used for repairs and then became the norm in new saddle construction. *1880's Loop seats appear. Square cut outs of the seat reveal tops of the stirrup leathers where they hang over the tree. Allowed for easy cleaning, oiling, and replacement. Popular through 1920. *1890's Saddle swells appear. Originally created by adding a type of bucking rolls around the fork. Later evolved into swells that were incorporated into the fork. Purpose is to prevent the rider's pelvis from slamming against the fork on a bucking horse. Without a saddle, a cowboy didn't have work, so the saddle maker was a needed profession of the old west. Here's the description and order link for Gabe's Pledge. 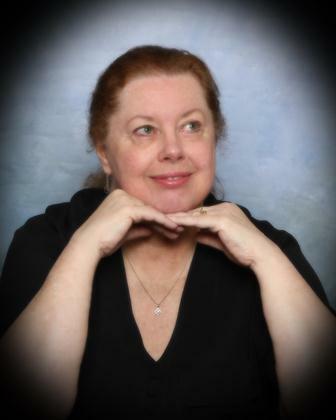 A sweet historical romance set in 1887. Gabriel Shepard has secretly loved Iva Mae Paulson for years, but has been too shy to court her. 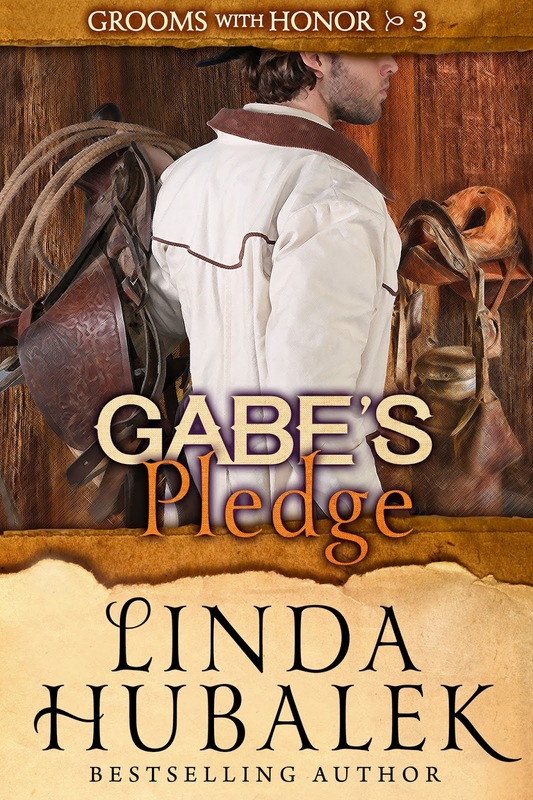 But when Iva Mae announces at a New Year's Eve party that her 1887 resolution is to find a groom, Gabe must decide if he's ready to lose her to another man, or step out of his saddle shop to pursue her. Iva Mae Paulson loves teaching children but after six years, she wants her own family instead. Since her choice of husband won't take the first step, she'll set her own destiny by signing up to become a mail-order bride. Help and hindrance by family and friends makes this a comical trip down the church aisle for this couple. This post was first published on Petticoats and Pistols. Due to time constraints, I'd like to use it again this month for my contribution to Sweethearts of the West. 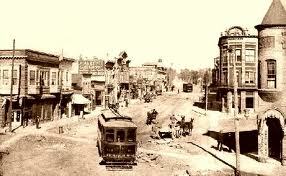 My time travel romance, My Heart Will Find Yours, is set in 1880s Waco, Texas. 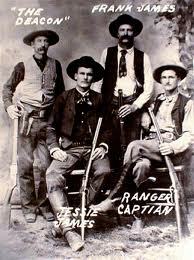 Located on the Brazos River, in its early history, Waco was known as Six-Shooter Junction. Trail drives herded their cattle across the Brazos in Waco and the cowboys usually spent time in the bawdy houses of the Reservation or Two Street as the red-light district was known. Drinking in the multitude of saloons and card games sometimes led to fights, often involving the use of firearms. When the suspension bridge opened in 1870, and the railroad arrived in 1871, business in Waco thrived. Trail drives repeatedly lost cattle when herding their livestock across the Brazos. It wasn’t uncommon for a man to be caught in the undertow and drown. Cattle bosses were willing to pay the 50 cents per animal to get their cattle across safely. 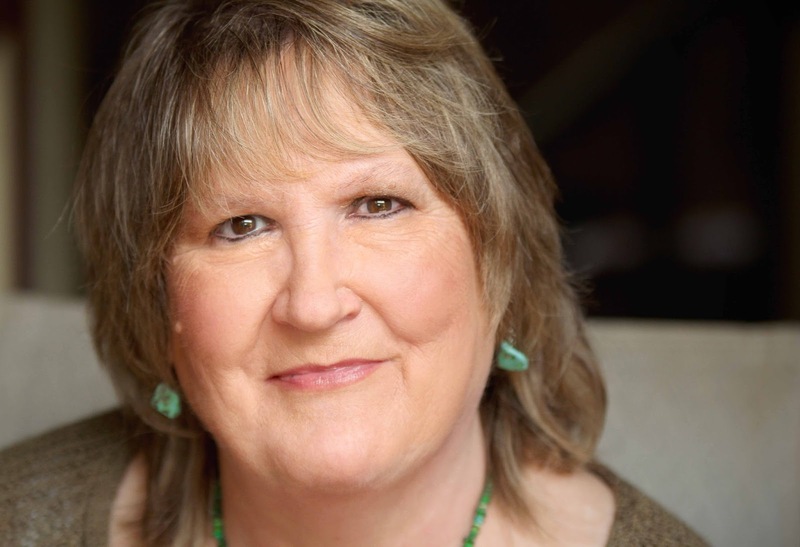 In her book, A Spirit So Rare, Patricia Ward Wallace broaches the topic of how women forged a path in the early history of Waco. Her chapter on prostitutes is titled Women of Controversy. Since prostitution plays a minor role in my western time travel romance, I’d like to borrow her title and share some of what I learned. The first noted record of prostitution in Waco is documented in an 1876 city directory. 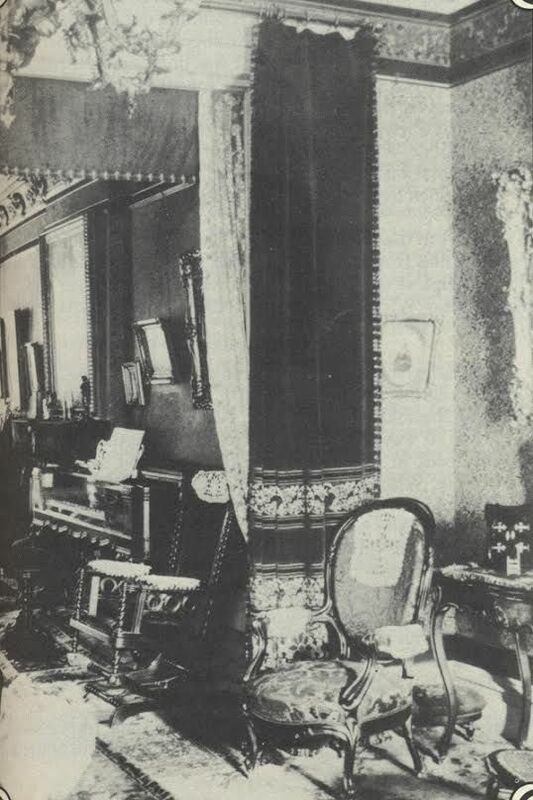 Matilda Davis of 76 N. Fourth St. is listed as a madam with 10 occupants in her house. The women listed their occupation as actress. Waco had no playhouse at the time. In 1879, the city issued the first license for a bawdy house for an annual fee of $200 and a good behavior bond of $500. Waco officials legalized prostitution within the Reservation in 1889 making Waco the first town in Texas and the second in the United States to condone a controlled red-light district. Madams paid a yearly fee of $12.50 for each bedroom and $10.00 for each bawd. 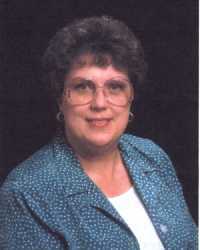 Prostitutes paid an additional $10.00 license fee and paid the city physician $2.00 twice a month for a medical exam. This guaranteed they didn’t ply their trade outside their designated territory and were disease free. The city prohibited drinking within the area. Fines for violators ranged between $50 and $100. With the large number of prostitutes it’s easy to see the city benefited from trade within the Reservation. Prostitutes were prohibited from being seen on the streets outside the Reservation yet they were allowed to trade with local businesses. No more than two at a time could travel via a city hack to the stores. Usually tradesmen sent clerks to the curb with merchandise. Some store owners required the prostitutes to stop at the back door. Life was hard for these working girls. Violence abounded in the bordellos as did drug and alcohol use and abuse. Though licensed, the police had little to do with the establishments. 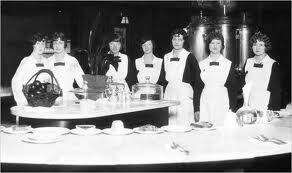 The madams disciplined the women in their houses and maintained order among their clientele. On occasion the police were called when robberies or assaults occurred. 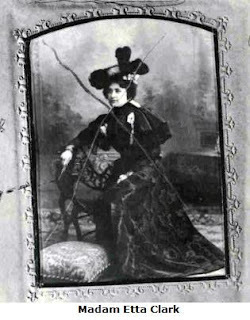 Waco’s most famous madam was Mollie Adams. She had worked in another house but in 1890 opened her own three-room operation. By 1893 she had a seven-room establishment. 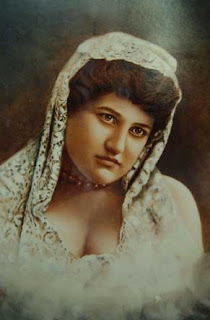 In 1910 she’d obtained enough wealth to commission a house to be built by the same firm that built the First Baptist Church of Waco and the building now the Dr. Pepper Museum. Her home at 408 N. Second St., had indoor plumbing, electric fixtures, two parlors, a dance hall, and a bell system wired to every room. Her portrait, included here, hung over the fireplace. Though wealthy at this point in her life, she died in an indigent home in 1944. 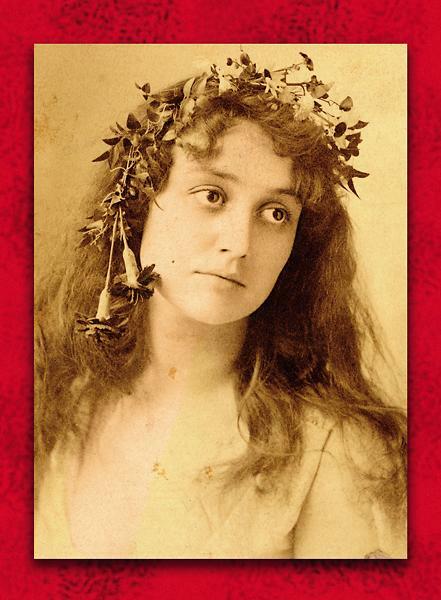 Lorna Lane, the madam in Madison Cooper’s epic novel, Sironia, is supposedly modeled after Mollie Adams. In 1917, the US Government ordered cities with military bases to shut down red light districts to protect the health of America’s soldiers. Not wanting to lose Camp MacArthur and its 36,000 troops, the city shut down the Reservation in August of 1917. It is rumored some bawdy houses managed to continue business through the 1920s. Wallace, P. W., A Spirit So Rare, pp. 148-156. What comes after laundry day? The ironing. Not a pretty chore and certainly something that zapped the strength of our great-great grandmothers. We get off easy today with most of our clothes being permanent pressed. And if we do need to use the iron, they are lightweight steam irons that maintain the perfect temperature with special ultra slick surfaces to protect our clothing. As a child I can remember my grandmother (born in the 1880's) using a funny looking thing as a doorstop. I asked my mom about it, and she told me it was an iron. Huh? As a small child it took two hands to pick that thing up. I tried it one time, and was scolded for if I ever dropped it on my feet… I probably would have crushed not just my itty-bitty piggy toes but also my little foot. It was my other grandmother who told me about irons. She barely scratched the surface, figuring I'd probably never need to know about such an antiquated item. Zip forward to the present. Guess those women in my family never figured I'd grow up to be a writer of historical fiction. (Oh how I would love to pick their brains today!) So I've had to acquire the knowledge along my strange paths of research. Oh, be ever so thankful to have that electric steam iron with its super shiny surface, because going back even 100 years that wasn't the case. Let's look at an old iron. The process of ironing is simple. Heat and water along with pressing the garment forces the molecules to move, allowing the fibers to stretch thus releasing the wrinkles. 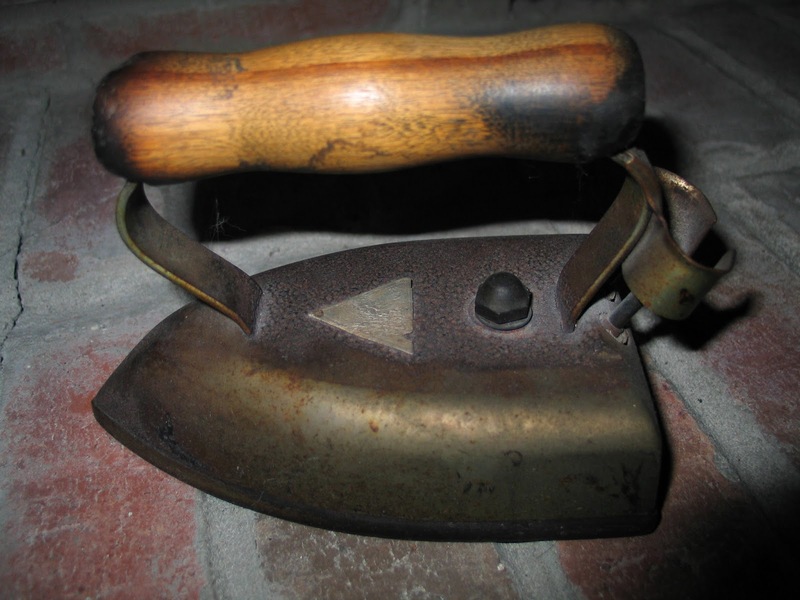 So way back in the 1800's and earlier an iron was made from (surprise!) iron, which is where we get its name. Fabrics were sprinkled with water, and often with water that had starch dissolved in it. That's the water portion of the process.😀 The pressing has never changed. It's what my grandmothers called elbow grease, or the manual job of moving the iron over the clothing. The heat came from heating the iron on a stove. Kitchen stoves usually were wood burning. But any sort of stove would work. For the most part, every house had at least three irons. Two to heat while the other was busy pressing the fabric. When it cooled, you switched irons. But the more delicate the fabric the less weight or elbow grease was needed. So often an average household might contain six irons of two different weights or maybe nine with three different weights, that's based on per person ironing. the iron wasn't heavy enough, a box iron contained a box that was filled with hot coals or hot stones. The nice thing was they tended to stay hotter longer being the heat source was in the iron. It could also make them extremely heavy. many times have I pulled the cookie sheet from an oven and burned my wrists? I don't think anyone would trust me with one of these old irons. Can you imagine the whole handle being that hot? Some brilliant person discovered they could add asbestos into those pads and protect the hands. Asbestos? Yikes! wooden handle that allowed you to switch from one iron to another using that same "cool" handle. It worked but apparently wasn't super great. Then in 1882, Henry W. Seeley invented the electric flat iron. At fifteen pounds, it took a while to heat, and there was no electricity in our untamed west, on the back roads of our farms, or for those living in small towns. So the old heat-'em-on-the-stove irons were used well into the twentieth century for most families. If you've ever used an iron frying pan, you know how important it is to protect and properly care for that pan. 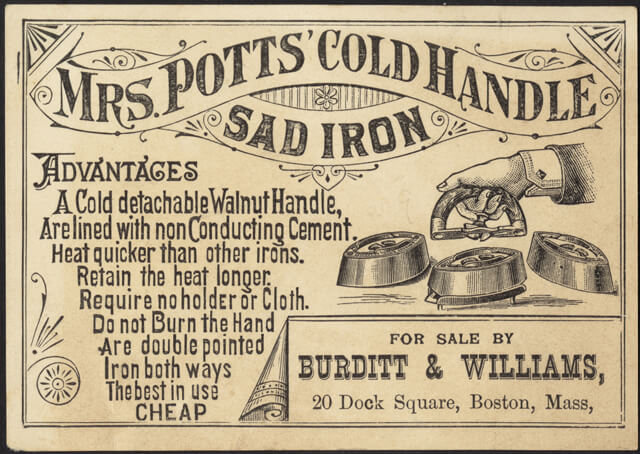 Well, those old irons were just as prone to rust after ironing all those clothes sprinkled with water. So they needed special care. As we all know, keeping that sole plate smooth is important to the fabrics so that we don't tear the material. (That's why mom said not to scratch the iron on zippers, etc.) To protect the old irons, they were sanded smooth. Then greased. Better get that right or you'd make a terrible mess of your next ironing job. That's got to be what fatback was originally used for because the recipes my Southern friends have that call for fatback, Yankees use bacon. 😉 Then the iron was wiped and waxed with beeswax. And it didn't take much beeswax or you'd have another mess. So when you were finally done ironing all day, you get to resurface those irons because you wouldn't want them to rust. One more thing, everything you owned had to be ironed. Sheets, pillowcases, chemises, skirts (oh so long! ), blouses, shirts, pinafores and jumpers (aprons), pants, hankies, underwear, stockings, even the babies' diapers, dishtowels, bath towels (skip thinking they were terry towels - usually made from hucking or something similar), everything had to be ironed and many things had to be starched! 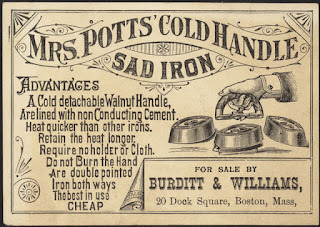 So try standing and ironing for hours with hot, heavy irons during the summer. And don't forget to keep that stove hot to maintain heated irons. I'm so glad I live today. As for my iron, ah, I think it's in the closet upstairs, but I wouldn't make any bets. I don't even remember the last time I used it. I figure that's a good thing. WILD WESTERN LAS VEGAS--"THE OTHER ONE." Since Cheri Kay Clifton wrote about the BIG Las Vegas, I thought to re-run my post about "The Other Las Vegas--in New Mexico." 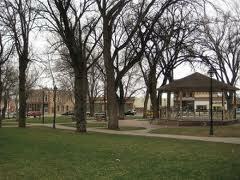 ﻿Las Vegas, New Mexico lies at the base of the foothills of the Sangre de Cristo Mountains (The Blood of Christ). Las Vegas means "the meadows." The town is 65 miles due east of Santa Fe. Las Vegas, New Mexico was established in 1835 after a group of settlers received a land grant from the Mexican government. They laid out the town in the traditional Spanish Colonial style, with a central plaza surrounded by buildings that could serve as fortifications in case of attack. Las Vegas soon prospered as a stop on the Santa Fe Trail. During the Mexican-American War in 1846, Stephen W. Kearny delivered an address at the Plaza of Las Vegas claiming New Mexico for the United States. When the railroad arrived in 1880, it set up shop one mile (1.6 km) east of the Plaza. 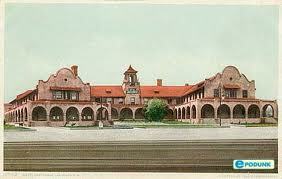 Fred Harvey showed up and used one side of the station as the Hotel Castaneda, complete with one of his already famous Harvey Houses. The arrival of the railroad on July 4, 1879 brought with it businesses and people, both respectable and dubious. Murderers, robbers, thieves, gamblers, gunmen, swindlers, vagrants, and tramps poured in, transforming the eastern side of the settlement into a virtually lawless brawl. 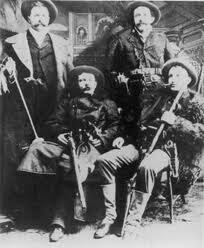 Among the notorious characters were legends of the Old West: the Younger Brothers, dentist Doc Holliday, Jesse James, Billy the Kid, Wyatt Earp, Hoodoo Brown, The Durango Kid, Handsome Harry the Dancehall Rustler, and the Cole Brothers. "Without exception there was no town which harbored a more disreputable gang of desperadoes and outlaws than did Las Vegas." In 1970, my husband and our two elementary school age children lived in Las Vegas one year while he taught at New Mexico Highland University. The school is such a beautiful small college, and the rich experiences we encountered that one year have always stayed with us. Living in an old renovated adobe house was quite an experience, with its polished vigas across the ceilings, pine floors, and a very small adobe fireplace in a corner. How I longed for an even floor, straight walls, and doors that shut properly. Nothing in a 100-year-old adobe house lies as it should which became part of its charm. 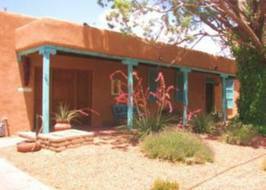 The foot thick adobe walls kept us snug and warm during that one cold winter. The window over my kitchen sink looked toward the close Sangre de Cristo Mountains, and many afternoons a rain shower moved across, watering my flowers and garden, moving on, leaving bright blue skies. Note: We moved on to Oklahoma where my husband earned a PhD and I taught high school. Stillwater did not have the same old wild west feel to it, but we did enjoy our three-year stay there, too. Next move was to our present home in Central Texas, San Marcos. Thank you for visiting Old Las Vegas.